Blue Picardy Spaniel is a versatile sporting dog with a reputation for locating and retrieving game under the most adverse conditions. The first French spaniels had their beginnings in the Middle East when French knights travelled to the Holy Land accompanied by their pointers and hounds, which interbred with Arabian Greyhounds. Over time, the spaniels of France separated into regional types. Picardie, France, was a paradise for hunters of waterfowl and, at the end of the 19th century, British hunters and dogs came to hunt in the area’s marshes and moors. When the British quarantine was put into effect, many English hunters boarded their setters on Picardie farms. 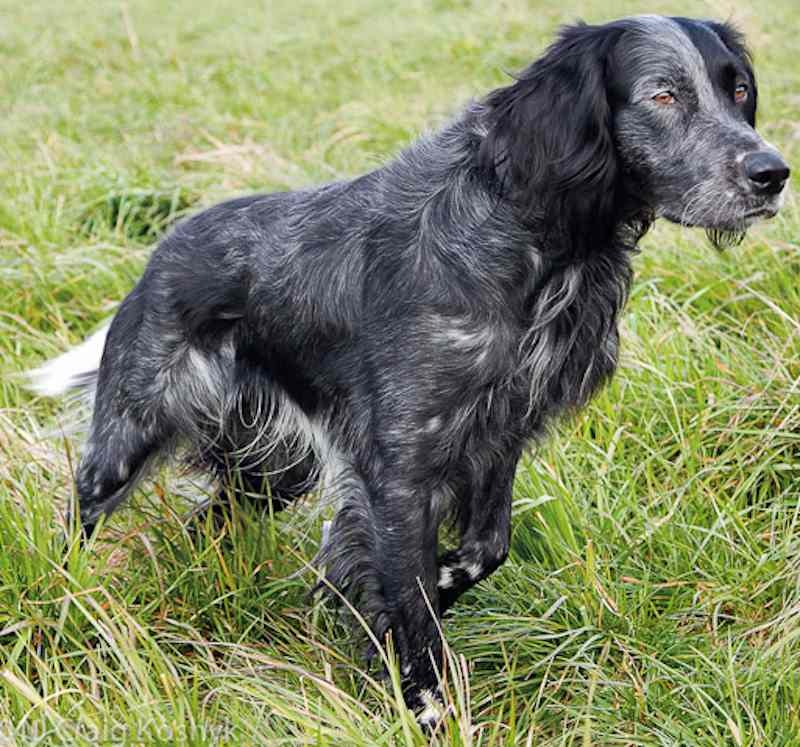 Consequently, Picard spaniels were crossed with blue belton English and Gordon Setters and the Blue Picardy Spaniel was the result. Blue Picardy Spaniel Temperament: The Blue Picardy Spaniel is a docile dog with a calm demeanour. Patient, well-mannered and very adaptable, it gets on well with other dogs and animals. Though noted for being both gentle and playful with children, the Blue Picardy Spaniel will always announce the presence of strangers and is ready to defend his family if the need arises. General Appearance: This dog is close to the ground, well built for work. General aspect much like that of the Picardy Spaniel. Size 22-24 inches (57-60 cm) at the withers for males, a little shorter for females. Coat and Colour Hair is flat, or slightly wavy, mottled grey black in colour giving it a bluish tinge with back spots. Good feathering on limbs and tail. Head: Nose large and well open. Muzzle long and sufficiently wide. Lips chops large and well let down, forming a square muzzle. Stop moderately accentuated but marked. Skull oval, relatively large without bulging parietal bones, occipital bone slightly apparent. Eyes calm expression, dark, large, well open. Ears must be set on a little above the line of the eye, rather thick, framing the face, covered with silky wavy hair; when stretched lengthwise, it must reach the tip of the nose. Neck: Well set into the shoulders. A very slight dewlap is allowed. Body: Chest moderately deep. Ribs well sprung and descending to the elbows. Back and loin not too long, well held together. Croup slightly falling away. Forequarters: Shoulders and arms slightly sloping. Upper arms strong and muscular. Feet round, a little large but not flat, well covered with hair between tight fingers. Hindquarters: Thighs muscular. Lower shanks long and well feathered. Hocks angulated without exaggeration and well feathered from the hock joint to the foot. Feet round, a little large but not flat, well covered with hair between tight toes. Tail not much longer than the hock joint, never hooked. Faults: Skull too narrow, not chiselled enough. Muzzle pointed. Eyes light, too small. Ears short, set on too high, too thin. Feet flat, splayed or too large. Chest ribs too flat or too round.